The new taskbar in Windows 7 does not allow you to pin anything directly on the taskbar by default. 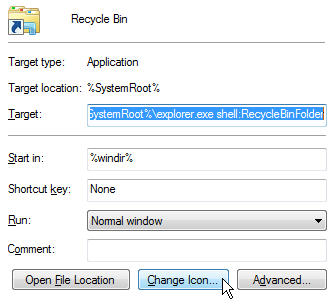 If you tried to pin Recycle Bin already you would have noticed that it is pinned under the Windows Explorer program instead of a separate icon. In order to pin it directly on the taskbar you have to know a few tricks. 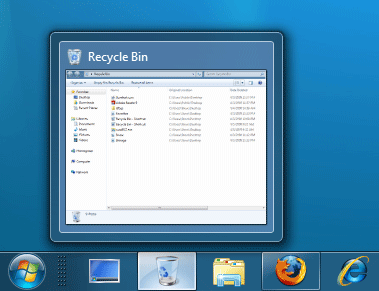 In the end, your will have a dedicated Recycle Bin shortcut pinned directly on the taskbar as shown below. Right click anywhere on your desktop and select New and then shortcut. For the name type in Recycle Bin. Now your shortcut will be created but it will not have the right icon. Right click on the shortcut, select Properties. Then, click Change Icon as shown below. 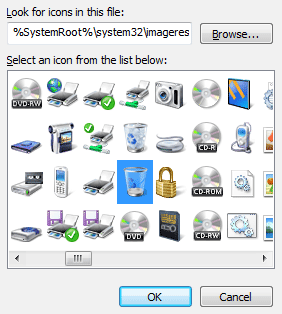 Hit Enter and select the Recycle Bin Icon and click OK. Finally, drag the new shortcut onto the taskbar and it will be pinned directly. Once the shortcut is pinned, you can delete the original on the desktop.